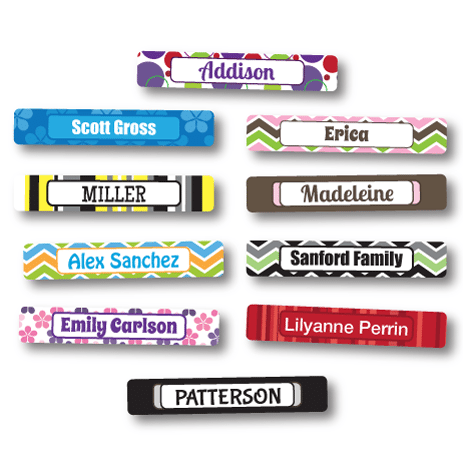 Waterproof, durable labels for kids to customize for all those long or skinny items! Label those toothbrushes for overnight camp, label kids’ school supplies, label your utensils…we’re sure you will find these a hit in your home. Our Mini labels are a fantastic name label solution for school, camp and beyond! These waterproof, durable labels are dishwasher-safe, laminated and color fast. They don’t fade, crack, or tear and won’t peel off. Families love these labels for labeling pens and pencils for school, small camp items like iPods, toothbrushes, and toothpaste, and baby items bottle caps and diaper cream. These personalized labels are a customer favorite – tons of labels with clear, readable text at an affordable price. Got an item to mark your own? Chances are, these are the custom kids labels you need! If not, check out our larger Rectangle labels or our smaller Micro labels!